Scotland’s James Wilson won the Welsh Open Stroke Play at Pyle and Kenfig, beating England’s Tom Sloman in a sudden death play-off. The pair finished locked together on level par at the end of the 72 holes, before Stirling University graduate Wilson won the first hole in the play off with a birdie. Will Poole of Mendip Spring was third, one stroke off the leading pair. The Welsh challenge was led by Wrexham’s Daniel Lloyd, joint leader at the halfway stage and finished 10th, while Celtic Manor’s Lewys Sanges was tied 11th with fellow Welsh players Jake Hapgood of Southerndown and Patrick Mullins of Whitchurch tied 13th. Wilson, aged 22 from the Balmore club in Glasgow, said, “I am delighted, it is my biggest win. “I have not really come that close in national events before so to go the whole way the first time of asking was nice. “I have played a few play-offs this season and even though they have not gone that well for me it did mean I was well prepared for what was coming. “After nine holes I saw Will Poole had posted one over, then I saw Tom had got to level, so I knew what I needed to do and was able to par my way in. Wilson graduated from Stirling last year, worked through the winter to fund his summer golf. “I have no plans about how long I will be playing, as long as I keep improving then I will keep going,” he said. There was a truly international field with a strong representation from the Home Nations, as well as players from around Europe and even Australia. 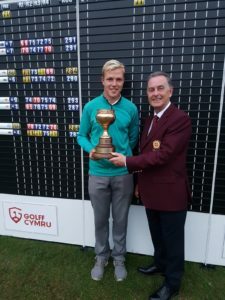 “Congratulations to James for winning a thrilling encounter and to Tom for making it such a close contest,” said David Wilson, Wales Golf championships manager.